Ask any person in Jakarta if they know who "Si Pitung" is and you'll probably hear them reply "Yes!" emphatically. An Orang Betawi or descendant of the indigineous people who lived in the Batavia ( the old name of Jakarta) area during the Dutch colonial times, Si Pitung is probably the most well-known outlaw in the history of Indonesia and adored by many Indonesians even today. However, like most folk legends, his story is a mix of historical hear-say and popular myths. Pitung was believed to have magical powers, making him impenetrable to all kinds of weapons and even bullets. Artist's impression of the Betawi hero, Si Pitung, brandishing his twin goloks (Indonesian machete). I first heard of Si Pitung's name from our friend, Harry (from our affiliates, T.O.S.S. You can find them here). He told me that I absolutely had to visit Si Pitung's house to find out more about the story of this local Indonesian legend. Since I've always had a soft spot for folklore or stories / legends of such heroes, our conversation prompted me to embark on a trail to find out more about the local "Robin Hood" of Batavia. According to legend, Si Pitung was a robber who roamed around Batavia and its surrounding countryside between 1886 to 1894. He was a cunning individual and gave the Dutch a tough time by outsmarting them every time when they tried to catch him. Many words have been said and written about him but, as many of these stories are derived from legend and superstition and not rooted in documented fact, it's hard to say just how true they are. Despite this, the leaders of the Betawi community swear by Si Pitung's stories, feats and powers, some of which border on the supernatural. He is almost always portrayed as a pious Muslim and an shining example of a social justice during the criminality and banditry of the Dutch East Indies era. Sensing the great social divide in Batavia, he utilised his dexterity and guile to steal from the rich to give to the poor. Si Pitung was born in Pengumben, a village in Rawabelong (an area in present-day West Jakarta) to Bung Piung and Mbak Pinah. Si Pitung was sent to an Islamic school run by a gentleman named Haji Naipin as both his parents hoped for him to be a religious person who would help others when he grew up. After his evening prayers every day, he would train in the martial art of Silat under the watchful eyes of Haji Naipin until he became an extremely skilled practitioner. Pencak Silat martial artists demonstrating how to disarm a Golok wielding enemy during a Betawi wedding. After Si Pitung grew up, he was asked by his father to sell two of their goats at the market in Tanah Abang (incidently around the same area where the tomb of Olivia Raffles is located - we have a writeup on that here and here). The two well-fed and healthy goats were quickly sold and he made his way home. He soon realised that the money he made had been stolen. He thought hard and recalled meeting a group of five men who had held him in conversation at the market, suspecting that one of them might have picked his pocket. He knew right away that he would be in big trouble if he did not bring the money home safely. Flustered, he returned to the market where he found the five men. He confronted them for stealing his money and a fight soon ensued. Despite having the odds stacked against him, Si Pitung was able to overcome them with his impeccable Silat moves. It is said that his determination to recover the stolen money from the crooks gave rise to the nicknames Jago Betawi (translated as the Batavian Warrior) and Banteng Betawi (the Batavian Bull), a testament to his amazing perseverance and tenacity. 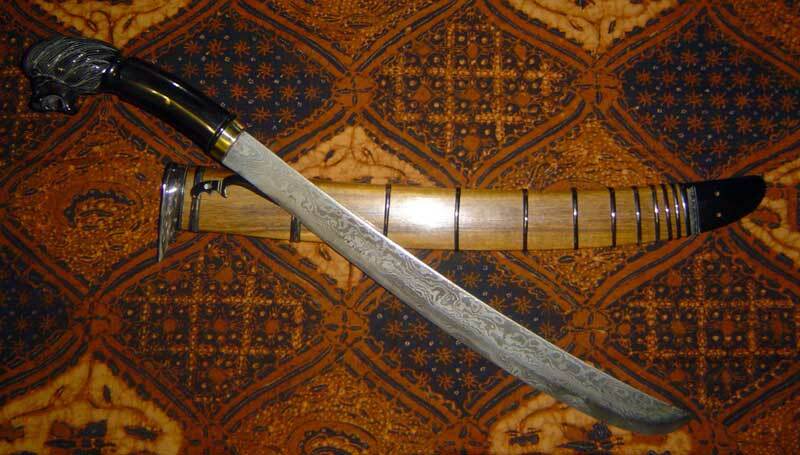 The Golok or Indonesian Machete was believed to be Si Pitung's weapon of choice. He later joined forces with three other robbers, namely Ji'ih, Rais and Jebul, to carry out their now-famous pilfering feats around Batavia. Their targets were often the wealthy Bugis, Chinese and Arabs and the gains of their robberies were given to the orphans and the poor and needy, many of whom were enslaved by debts to their rich landlords. Some say that Si Pitung was not just an individual, but a gang of seven robbers who operated under the same name. The word Pitu in means seven in Javanese, and could have gave rise to this belief as well. It is said that Si Pitung's burglaries never involved any act of violence and that he never resorted to murder nor even drew a single drop of blood from his victims. His agility enabled him to enter and leave the house of the rich quietly, and he never left any trace. Si Pitung's crime soon caught the attention of like this soon attracted the attention of the police and the Dutch police commissioner, referred to as Schout Hinne* by the Betawi storytellers, in particular. Scores of heavily armed men, guards and policemen were ordered to capture and lock up Si Pitung for good. *Schout Hinne (literally Sheriff Hinne in Dutch) in these stories is most likely an actual police officer named Adolf Wilhelm-Verbond Hinne who was stationed in Batavia between 1888 to 1912. An estuary village in Pulau Marunda, near Si Pitung's house. The house of Si Pitung which I mentioned earlier actually belonged to a wealthy landowner in Marunda (a village north-east of Batavia) named Haji Sapiudin, who was a Bugis himself. The story of how it became Si Pitung's house is rather interesting. The most popular version tells of how Si Pitung used a clever ruse to trick Haji Sapiudin out of his money in the year 1892. Disguised as civil servants, they visited the house and handed Haji Sapiudin a letter instructing him to place his money at their disposal, offering an excuse that he was under suspicion of forgery. Therefore, they were there to collect the money, which had to be taken to the office of the Demang (the village head) to have its authenticity checked. Since such checks were common under the Dutch at that time, Haji Sapiudin naturally complied with the request and Si Pitung made off with his money. 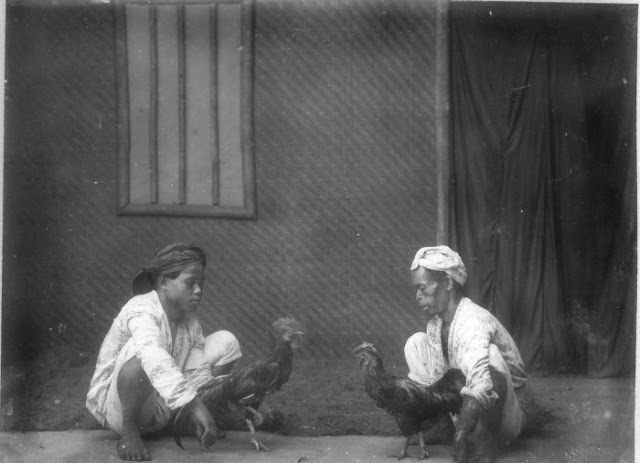 Betawi people engaging in a cockfight using Bantam roosters in colonial Batavia. Photo was taken between 1870 to 1900, and gives us an idea on how the locals were dressed during Pitung's time. Haji Sapiudin later found out that he had been conned by Pitung's band of bandits, but instead of turning to the authorities for help, the patient Haji Sapiudin decided to investigate the reasons behind Pitung's actions and before long, he learnt all about Pitung's valiant deeds. A person with a kind heart himself, Haji Sapiudin then decided to allow the Betawi Bandit to use his house as a hideout, which Pitung did for several years before his unfortunate death. The details of Pitung's eventual capture and death in 1912 is pretty murky, and there are several versions which Betawi storytellers tell off. One says that Pitung lost his mysterious powers after he cut his hair, resulting in his capture, while another says that he was killed by an egg thrown by a Dutch official, supposedly the only item which could penetrate his magical impenetrable skin. The most popular version, which was later used in a movie, depicts Pitung being killed by bullets made of gold; similarly his magical armour was broken by the golden bullets. Hence, Si Pitung's House, or the Tall House of Marunda as it is commonly known, is not really where the Betawi Bandit lived, but rather his hideout from time to time. 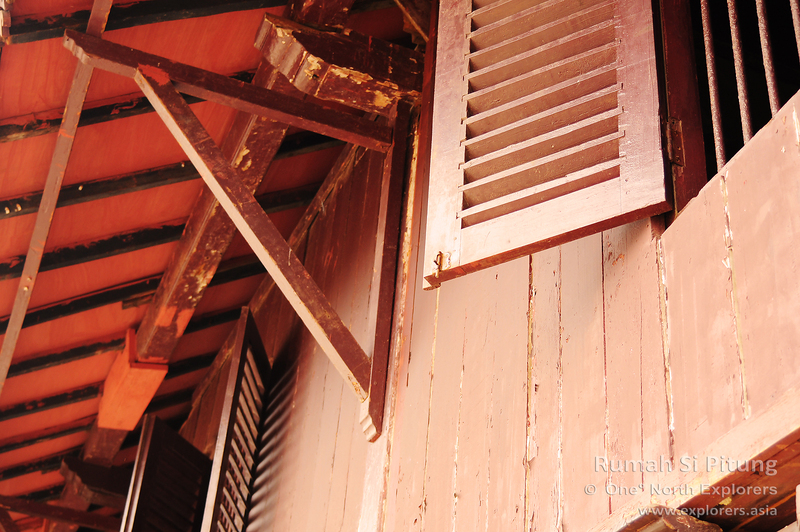 The wooden house, built in the architectural style of the sea-faring Bugis people, is supported by 40 wooden pillars and has 10 windows and 4 doors. This kind of house is common for coastal communities to nullify the danger caused by heavy waves rolling onto the shoreline. Having a house on stilts helps to alleviate floods. The trellis beneath the floorboard employs simple but effective engineering. Peering into the house as I ascended the entrance ladder, I noticed that the entire house was not just painted in maroon on the outside, the inner walls and floor were coated with the same reddish colour as well. I understand from the caretaker that the house's floor was originally made of bamboo, but this has since been replaced with wood when the Indonesian government refurbished the place in 1972. The teakwood walls are original though, and were painted over during the refurbishment. As I ascended the stairs and entered the living room, I was greeted by a faceless mannequin dressed in traditional Betawi clothing standing in a corner. A peculiar drawing found above a doorway, which reminded me of a classical Hindu deity image. The faded picture features a pair of pegasus-like creatures, with some Arabic inscriptions above. Update: One of our helpful readers, Mr. Othman Husain, informed us that the pair of mythical creatures in the picture above are actually the Al-Burāq, a mythological steed which descended from the heavens to help transport the prophets in their ardous journeys. The most famous story involving the Al-Burāq is probably that of how one carried the Prophet Muhammad from Mecca to Jerusalem and back during the Isra and Mi'raj (the Night Journey) as described in the Quran. Being a pious Muslim, it is therefore logical for the picture above to be displayed in Si Pitung's house. We'd like to thank Mr. Othman for unraveling the mystery behind the picture. A painting, which depicts a traditional Betawi wedding, decorates the guest hall. While they could have made a statue of Pitung instead of using a faceless mannequin, the reason for this, or so it seems, is because no one knows what he looked like, according to the caretaker. A faceless "Si Pitung" greets you as you enter his home. As I stepped over a doorsill into a narrow corridor, I was greeted by a row of windows on my left and a small room on my right. The slats on the window blinds were barely open, letting in very little light, while a small faux kerosene lamp was employed as the sole light source inside the room. An electric light bulb was used in place of a kerosene wick and the yellowish light from the tungsten filament bounced off the reddish walls, which lent a gloomy feel to the whole place. A plastic sign placed behind the doorsill read out the words "Kamar Tidur" (bedroom) aloud and a rope was hung across the entrance, suggesting that entry was prohibited. There was a small canopy bed inside the room, and a dressing table and a wardrobe, both painted in maroon as well, completed the room's furnishings. I was perplexed at the low ceiling height of this bedroom. The occupant(s) must have been no taller than 5 and a half feet tall, or they would have had a hard time bending their heads forward to avoid hitting the ceiling! Continuing further into the recesses of the house, I entered the dining area. This part of the house was shrouded in darkness, and my attempt to push the slats of the window blind upwards was foiled by a nail which was strategically hammered in to keep the slats in place. Whoever did this obviously wanted the place to be this dim on purpose. An open doorway at the back of the house was the only passage where the bright rays of the sun outside could shine through. The darkness adds to the mystery. While it was blazing hot outside, the thick wood used in the construction of the house ensured that it was cool inside. The roomy interior and narrow gaps between the wooden planks also allowed the passing breeze to flow through the house. It was actually quite comfortable. After my eyes adjusted to the darkness, I found that there were several interesting artifacts lying around this part of the house and I decided to burrow further. A dakon (the Javanese name for congkak) board lies atop a woven straw mat. There was a dakon board placed on top of a woven mat to my left, while a dining table was placed on the right side. A curious looking stringed instrument was hanging on the wall above the dakon, prompting me to have a closer look. The instrument had a long, thin neck and a round bottom presumably made from a dried coconut husk. Upon closer inspection, I was pretty convinced that the instrument was in fact a Rebab, a traditional Indonesian lute. While not as famous as the Angklung to audiences outside of the Indonesian archipelago, the Rebab is commonly used in Ondel Ondel* performances. Ondel Ondel being performed in Jakarta. *Ondel Ondel is actually a Betawi performance involving two gargantuan puppets, a male and a female, dancing to traditional folk music. It is usually performed on the streets of Jakarta and believed to ward off evil spirits and offer protection. During a typical Ondel Ondel performance, the high pitched wail of the Rebab can be heard amongst the accompanying drum beats and gongs. Ondel Ondel performance. Note the usage of the Rebab in the music the puppets dance to. This esoteric looking rebab was painted in the same reddish hue as the house itself, and the body of the instrument was painted to resemble a face. There was a hole in the middle of the body where the instrument's sound would come out from when the rebab was played, and this part was rightfully painted over as the "mouth" of the ornamental face of the rebab's body. The initials "C.B" could be found above the two pegs near the top of the rebab, a rough indication of the owner's name perhaps? I also found an old rusty metal chest near to the rebab and I understand that this is a replica of one of the boxes Pitung used to store the money which he stole from the rich. The chest cover was welded and sealed shut so there was no way of opening it to see if there was any ancient money left over from the 19th century. Next, I moved towards the dimly lit recess area where a full sized dining table was placed. I could imagine the inhabitants of the house trying to have their dinner uncomfortably under these poorly lighted conditions. Even the large window, which was large enough for a man to pass through, was not helping much in brightening up the room.The thought of Si Pitung using the poor visibility inside the house to make a hasty escape through this large window should the Dutch authorities come a-knocking immediately came to my mind. It was definitely plausible. What drew my interest was not the dining table itself, which was your run of the mill wooden table, but a short cabinet placed against the wall nearby. Sitting on top of the cabinet was an ornamental ship made entirely of wood and metal. Maybe there was some secret scroll hidden inside this model like the one in The Adventures of Tintin: The Secret of the Unicorn (sorry if I spoilt the story for those of you who have not watched it yet). With my walk around the house almost complete, I decided that it was time for me to move on to the next part of my day's programme. My friend and guide, Hardi (with whom I explored the ruins of Surosowan Palace and Anyer Lighthouse in Bantam) had promised to bring me to visit the obscure grave of a heroic soldier from Maluku (an archipelago formerly known as the Moluccas or Spice Islands) which was nearby in the Marunda area as well. The curious thing about this grave was that it was located within the midst of a bonded area where imported items were temporarily stored. Fueled by my curiosity, I quickly boarded the car and was led by Hardi past rows upon rows of large, 40 foot containers after moving past a bucolic Customs security post. It was pretty unbelievable for such a relic to be located in such a secured area, much less a grave that was recognized by the city's Museum and Restoration Agency. The pot-holed and muddy track was not conducive for traveling at all, and it was a most uncomfortable ride as it started to drizzle outside, filling all the pot holes on the track with a mixture of mud and rainwater. Hardi choose to avoid all the pot holes (trying to guess the depth of a pothole filled with water can be pretty difficult) which made the zig-zag ride even more agonizing. As we ploughed through the mud track leading to this interesting vestige, Hardi told me more about the supposed background of the person buried below. The grave belongs to an individual named Captain Jonker, whom like Si Pitung, is a local hero based purely on legend alone. Jonker was a native of Ambon (the capital city of present day Maluku province or more commonly known as the Moluccas Islands in English) which is located more than 1,300 km away from Marunda. Apart from being known as Captain Jonker in the Marunda area (where the grave sits), he is also affectionately addressed as Tete Jonker back in Maluku, with the word Tete meaning "grandfather" in the Ambonese language. Jonker's story has been retold in both the Marundanese and Ambonese for many generations and he is revered as a hero by many. 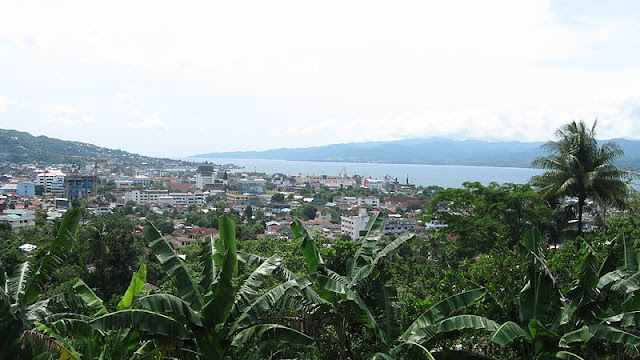 The coastal town of Ambon, capital of present-day Maluku province, where Captain Jonker is from. Like Pitung, Jonker has magical powers which granted him invincibility, uncanny strength and even the power to disappear at will! He is depicted as a soldier who later deserted his colonial employers as he was dissatisfied with the way the Dutch treated the locals. According to the Sejarah Teluk Jakarta (History of Jakarta Bay) book which was published by the Jakarta Museum and Restoration Agency, Jonker was stated as being from the Tumelaku Manifa area located west of Ambon Bay. He was recorded to have joined the Dutch forces between 1661 to 1682 before he moved to Marunda in 1684. During his time with the Dutch, Jonker had secretly made contact with local insurgents to find ways to push the Dutch colonial masters out of the Dutch East Indies. However, he was betrayed when one of his subordinates who reported his actions to the Dutch. Arrangements were made to eradicate Jonker and he was beseiged by Dutch troops from all directions and killed. Jonker was then buried in Pejonkeran, an area which was named in his honour. Captain Jonker is not to be confused with another popular hero, Kapitan (Captain) Thomas Matulessy, better known by his pseudonym Pattimura, who hails from Ambon as well. Pattimura joined the British forces after the Moluccas were wrested from the Dutch, but was dismissed when the islands were returned to the Netherlands after the Anglo-Dutch Treaty was signed in 1814. 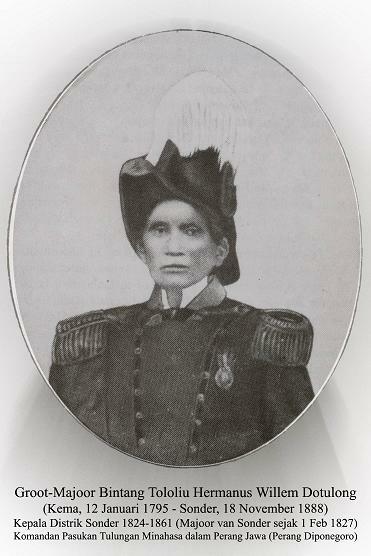 Appointed the rank of Kapitan by the people of Saparua, where he was born, Pattimura went on to lead an armed rebellion against the Dutch which culminated in the capture of the important Dutch fortress Fort Duurstede on 16 May 1817, where his forces killed off the colonial inhabitants, including the Dutch Resident - Juan van den Berg - and fought off Dutch reinforcements. Only van der Berg's five year old son was spared in the onslaught. Pattimura was later betrayed by a pair of Ambonese traitor siblings, Patih Akoon and Julian Tuankotta, and was captured by the Dutch and subsequently hanged in Fort Nieuw Victoria in Ambon together with three of his comrades in 1817. Due to his legacy and fierce patriotism, Pattimura was named as a Pahlawan Nasional (Nationa Hero) of Indonesia in 1976 by then-president Suharto. 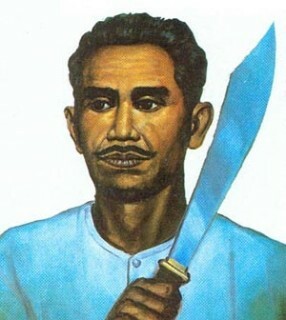 His namesake can be found in several places in Indonesia, particularly in the city of Ambon and his likeness has also been immortalized on the 1000 Rupiah note, brandishing a Golok (which happens to be Pitung's weapon of choice as well). Captain Pattimura's image on the 1000 rupiah note, brandishing his trademark Golok. In the present day, Jonker's tomb receives visitors from all walks of life who come to the site either to pray or to meet the caretaker of the grave. The caretaker is well known among the locals as a diviner who is able to foretell the future after he imbibes alcohol and goes into a trance-like state. Some say that he has to get drunk in order to carry out his divination work because he had to become one with the spirit of Jonker, who was an alcoholic himself. After making a turn into a seemingly endless mud track which branched off from the container yard, we finally arrived at the site where the tomb was located. Although many believe that the tomb has been here since Captain Jonker's death, it was actually located in a common cemetery near to Jakarta Bay and only moved to its present location in 1950. It is hard to imagine that the grave was just a pile of mud decorated with scant stone before the authorities constructed a proper shelter for the grave in 1965. The surrounding area was subsequently developed into the Marunda Industrial Bonded Zone as the city of Jakarta grew in size, which explains the weird location of the grave in the present day. Many believe that Captain Jonker was a Muslim because his tomb faces west, incidentally the same direction towards Mecca. However, several crosses and crucifixes can be seen around the graveyard, confounding visitors to Jonker's true religion. Many Ambonese stick by the belief that Jonker was a Christian, like many Ambonese today. It's hard to imagine a grave complex like this being located in the midst of an industrial bonded zone. As we approached the grave complex, it became apparent that the tomb was covered by a concrete roof with eight columns. The structure was painted mostly in red, and some of the surfaces were adorned with white ceramic tiles. I had to bend my head to enter the complex, and, although I was expecting to see Captain Jonker's name on the headstone, I was puzzled when I actually saw that this tomb belonged to another individual. It was clear that this wasn't Jonker's grave. Judging by the following words which were inscribed on the headstone, it was evident that this was the grave of an individual named T.H.W Dotulong. A bottle with an open cap, was placed near the headstone, as if it was offered to Dotulong himself. Fresh flower petals were also spread over the earth which covered Dotulong's body. After doing a little research, I found out that T.H.W Dotulong was in fact Tololiu Hermanus Willem Dotulong, a soldier and commander who hailed from the Minahasa area of the northern Celebes islands (now known as Sulawesi). He was one of several Minahasa soldiers which fought in the Java War between 1825 to 1830 for the Infanterie Nederlandsche Oost-Indie (Dutch East Indies Infantary) against Prince Diponegoro's rebellious forces. Patilasan is a loan word from Javanese for a sacred place where ones' ancestors, or an important figure in the case of Dotulong, once stepped foot upon or lived. The title Groot Mayor stands for Sergeant-Major, the rank which was held by Dotulong where he was also bestowed the title of district head for the Sonder area in North Sulawesi. 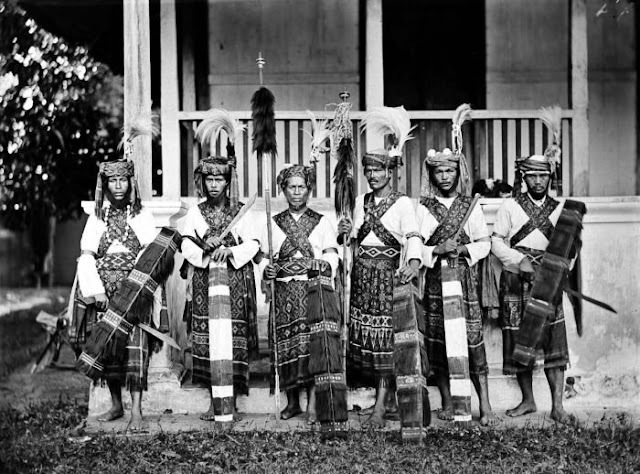 Minahasa warriors of north Sulawesi. Circa 1884. The headstone states that Dotulong was born in Kema, North Sulewesi in 1795 and died in Sonder in 1888. The verse below which says "sakita esa sumerar kita, sakita sumerar esa kita" is a motto for brotherhood and derived from the Minahasa people, it roughly means "we must spread ourselves (the Minahasa name and culture) far after we unite, and although we may be scattered after that, we remain united as one people." The mysterious thing about this grave was the fact that there was another grave in Sonder which was supposed to be Dotulong's final resting place. Since Dotulong died in Sonder, it makes the most sense for him to be buried there since his body would have to be carried thousands of miles to where I was standing now. Hence the question goes begging - who lies beneath this grave then? Is this really the grave of Groot Major Dotulong? As we were surveying the area around Dotulong's grave, we were approached by a man in a yellow raincoat who asked if we had came to pay our respects to Captain Jonker. "Oh, his grave is inside here." he pointed to a larger building which was just beside Dotulong's grave when questioned on the whereabouts of Jonker's grave. From its external facade, it was hard to tell that this building housed the grave of someone prominent. It looked more like a shed where the caretaker kept his tools. It seems that one had to seek permission from the authorities or the caretaker himself to enter the grave complex according to the man, whom by now had identified himself as Pras, the caretaker of both Dotulong's and Jonker's graves. We identified ourselves and Pras gamely agreed to let us in to take a few pictures. "I am surprised that a Singaporean would be interested in our culture and history" said Pras as he removed the lock from the wooden door. "I normally receive people from all over the country who come to the tomb to pray for luck and wealth, but never a Bule (a colloquial term for a foreigner)." As the door was being opened by the caretaker, we stared at the dark doorway. There was no light inside the mausoleum, and there was a moldy stench emitting from within. The dark sky and brewing storm outside did not help much with our visibility. "Please" said Pras, gesturing for the both of us to enter the room. As Hardi entered the building, he said the words "Assamualaikum" (peace be upon you) softly and I followed suit out of respect. In the darkness, we could make out a grave that was located somewhere near the middle of the room. The headstone had a unique top which was shaped like a roof, which was painted in red and plastered with white tiles like Dotulong's tomb outside. However, while Dotulong's headstone was inscribed with more detail, Jonker's tomb was merely told visitors of his rank, name and the place he was from. The stars above his name is probably an indication of his rank - Jonker has three, while Dotulong has one. The name Jonker was also spelt as Yonker as the Dutch pronounciation of the letter 'J' sounds like the letter 'Y'. "That's where the body's head is, right below that rock." Pras said, pointing to a large long rock near to the headstone. The rock was curiously red in colour. "This rock was part of the original grave, before the Government helped to build this mausoleum." Pras added. I could see that there were 2 other gray rocks placed at the other end of the grave, presumably to indicate Jonker's feet. I also noted that cigarettes were placed on the grave area as offerings to Jonker. This reminded me of the time where I found cigarettes being offered to the stone lions outside of the infamous Pasir Ris Red House many years ago. Taoists also offer cigarettes regularly to idols of Tua Li Ya Pek (大二爷伯), dieties who hail from the Netherworld of Taoist mythology in return for windfalls or wealth. Cigarettes being offered to Captain Jonker. Many believe that Dotulong was one of Jonker's subordinates, which explains the proximity of both graves. However, I strongly believe there is a certain degree of error in this, as Dotulong fought for the Dutch, while Jonker was believed to have fought vehemently against the Dutch. As I stood at the end of Jonker's tomb, I held up my trusty compass and it indicated that his body was indeed facing feet first in a a west-northwest direction. Judging from a geographical standpoint, it is quite possible that Jonker's body was buried to face Mecca. Puzzled by this, I asked Hardi for his opinion. Hardi explained that the vast majority of the people in Marunda, or Batavia for that matter, were Muslim. Hence, the locals probably buried Jonker's body in accordance to Muslim tradition. Even Pras himself was not sure of Jonker's religion. "I've seen numerous people from both faiths visiting this grave. I guess the most important thing is not the religion you believe in here, but the amount of belief you place into that religion. Miracles do happen." Many would assume that Jonker was a Muslim because of the way that he was buried, but we all know that the Portuguese annexed Maluku in the early 1500 and converted many of the indigenous people to Christians. That was followed by Spanish and Dutch rule. Therefore, most Ambonese are pious Christians today. Looking at Jonker's headstone, I could make out marking of a different faceplate which was probably removed and replaced with the current one later. The headstone looks evidently defaced and crudely patched with putty. To the right of the faceplate, there was a rectangular shape jutting out. I stood there and thought for a while. Could this have been a cross which was removed and replaced with the current rectangular plate? If it was, why was there a need to "cover" this (pun intended)? A popular Ambonese legend tells of how Captain Jonker transformed himself and his wife into a pair of pigeons who flew from Batavia back to Maluku. For that reason, the pigeon is believed to be a symbol of returning home safely and it is employed in the Coat of Arms of the self-proclaimed Republic of South Maluku, which has remained in exile since its defeat to the Indonesian Armed Forces in 1950. In the same complex, there was a small well located in the far corner of the room. We shone a torch inside and could see that the well was still filled with dark, murky water. This could well be the famous well of the Penjonkeran which was thought to have disappeared but was in fact covered by the four walls and the roof of the mausoleum. Hardi and I both paid our respects to Captain Jonker and as we were about to leave, Pras asked if we would like him to perform some divination work for us. We politely declined. He then suggested that we come back here in the evening if we had anything we wanted to ask Captain Jonker as he would be receiving guests who come in search of answers, or simply to ask for luck and wealth. As we stepped out of the mausoleum, I noticed that the storm had died down a little. Hardi gestured for me to follow him to the car. "Let's go for some Bandrek (a popular drink made from palm sugar, cinnamon, cloves and ginger) to warm ourselves up." he suggested. "Why not?" I thought. It would be good to ponder over the numerous questions I had over a cup fo piping hot Bandrek. The visit to Jonker's grave definitely gave rise to more questions than answers for me. For those of you who love mysteries, I am still searching for the answers to these questions. Any help would be appreciated! 1. Why wasn't Captain Jonker buried in his native Ambon? 2. Could it be true that he was a Christian (like most Ambonese) who was mistakenly buried according to Muslim tradition by the Betawi people? 3. Was there a cross on Captain Jonker's headstone which was removed later? If yes, why? 4. Who actually lies beneath Dotulong's grave? 5. Why were the two buried near to each other when they were known to be loyal to different sides? Readers who may have a clue are encouraged to drop us an e-mail or to leave a comment below. I would love to solve this mystery together with you. And yes, the Bandrek is on me.